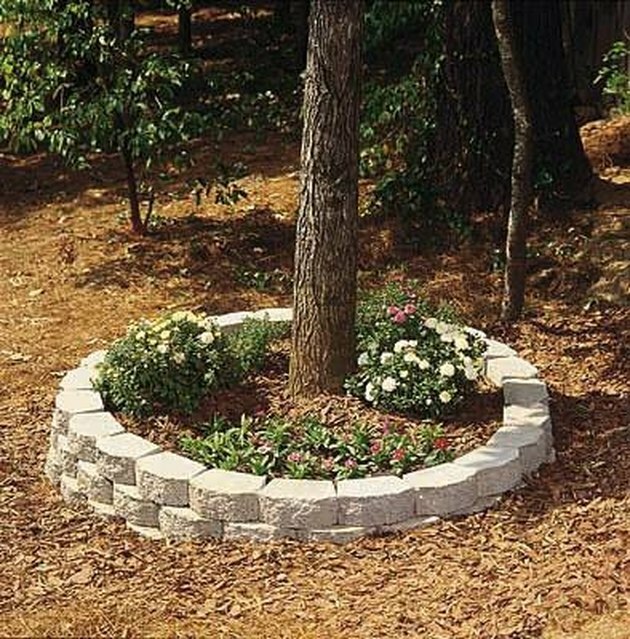 Adding circular brick planters to your outdoor landscape will add valuable curb appeal and aesthetic beauty to your home. This project requires some physical strength, because brick and block--and other supplies needed to finish the project--can be quite heavy. Some wall brick and block weigh in at 25 to 35 lbs. each. And the sand and soil needed to complete the project are quite hefty as well. Call on family, friends and neighbors to help you if you could use a few extra pairs of hands. Call local utility companies to come and mark their utility lines on your property to ensure your safety. Use spray paint to mark your excavation lines and begin digging a trench for the first course of brick or block. You have to excavate a minimum of 5 inches for the first course of brick or block. Also, the deeper your paver base, the more stable your wall will be. The trench should be 4 inches wider than the width of your wall brick or block. Use a tape measure to ensure the correct measurements for your project. Place a deep layer of paver base for the wall of your planter in the trench. Use a hand tamper to compact the layer of paver base to avoid any extra settling after the project is complete.